Refineries are a complex chain of machinery. Each piece in the facilitiy does its job for the greater good of the whole. 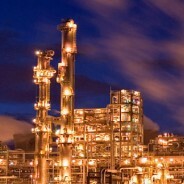 Within each part of the refinery there are levels of flexibility. This flexibility opens the door for greater optimization. Optimization should focus on the changing feedstock market to the changing landscape of product demand. Over the past few years we have seen shifts to greater distillate yields as the US market pauses on its demand growth. Many prognosticators should have seen the light many years ago. At AEC given our market sense along with our engineering principles we can help you optimize your refinery for the future.